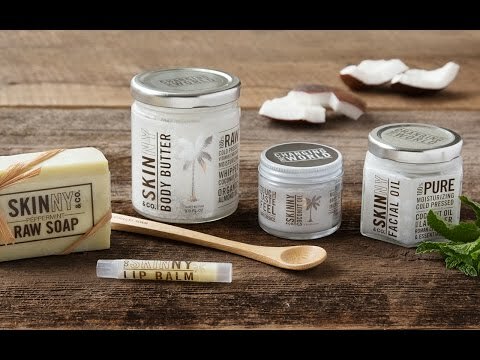 Live the chemical-free lifestyle on the go with these carry-on sizes of some of our favorite Skinny & Co. pure coconut oil health and beauty products. 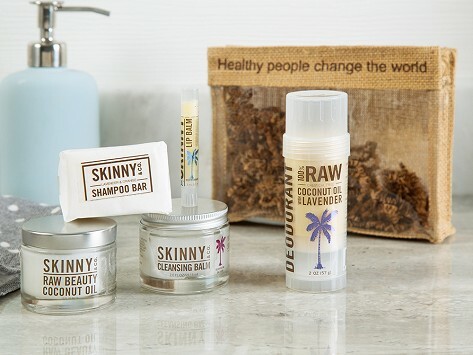 Skinny & Co.’s coconuts are hand-harvested in Vietnam. The oil is cold pressed, which keeps it in its purest, most nutrient-rich form. Other natural ingredients like essential oils and shea butter compliment the coconut oil as it moisturizes your hair, skin, and lips. Dimensions: 7" x 5.5" x 2"
Instructions: Apply a small amount of lip balm onto your lips for every day moisture. Use more frequently to help relieve chapped lips or mouth sores. Instructions: To remove makeup: Apply a nickel-sized amount of the cleansing balm onto your face and massage it in. Wipe makeup and cleansing balm away with a clean warm washcloth or tissue. To cleanse: Apply a quarter-sized amount of cleansing balm onto a warm washcloth or electric face brush and gently work into skin with a circular motion. Wipe cleansing balm off with a clean, warm washcloth. Fluid Content: 2 fl. oz. Instructions: Rinse hair with warm water before gently rubbing the Shampoo Bar against your scalp a few times. Next, rub the shampoo you’ve transferred onto your scalp and hair until you achieve a lather. The concentrated coconut oil will penetrate your hair as it lathers. Finally, rinse the shampoo from your hair with warm water. Use it to boost moisture in skin and hair, as cooking oil, or in oil pulling to help whiten your teeth and cleanse your mouth. Whichever way you use this amazing multi-tasker, raw is definitely the way to go.